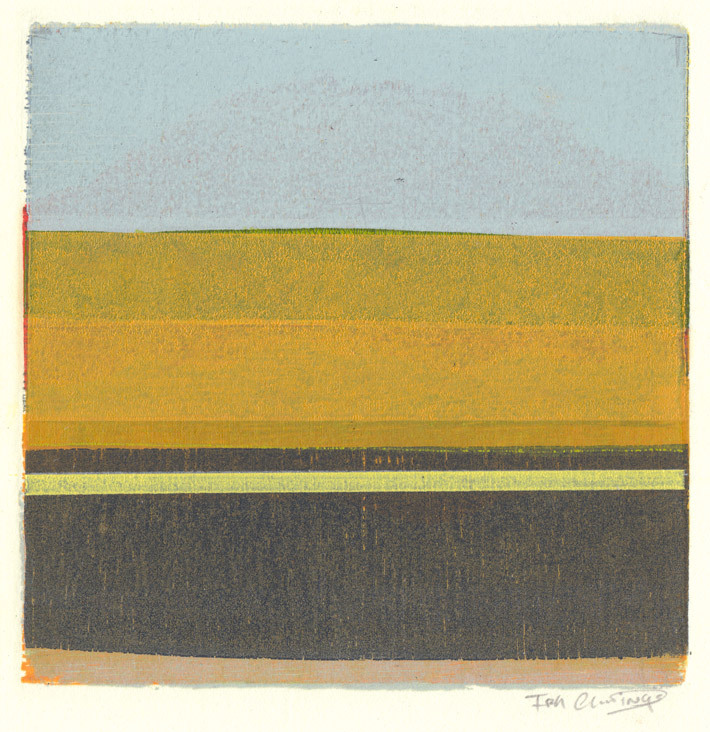 In this series of prints—the small, square monotype specifically—there are two groups: the circular prints and the color band prints. This monotype obviously falls into the second group, and while I have been working primarily abstractly for the past ten years, they reference landscapes. This is not particularly a conscious effort on my part, but probably something deeply embedded in the animal part of my brain. As a young(er?) artist, I always looked up to landscape painters. Indeed, I still do, but I realize that it is incredibly difficult to say something interesting about a landscape. Just have a pretty picture—whether it’s a painting, a print or a photograph—is not longer enough for me. If this print was actually a landscape, it would be saying something about the colors in nature, either the real or remembered. The color that is part of the local hue of an object, and the color that is perceived when the light has a certain quality. Well, it would say this if it was a landscape anyway.